Atari810 is free software (under the GNU/GPL software license) for emulating an Atari 8-bit floppy drive or hard disk on your PC. Ever Seen a Stack of Eight 810 Drives? What this means is that your PC, connected to the Atari via a serial port, appears to be a giant Atari disk drive, or rather, up to eight disk drives. 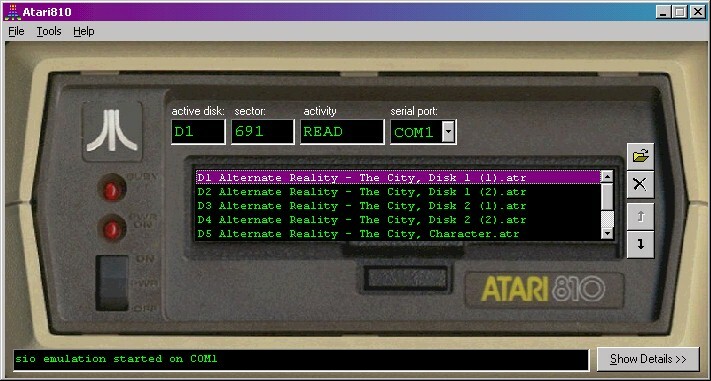 Instead of using real disks, the emulator uses disk image files which are just binary files containing a copy of each sector of a real Atari disk. The emulator supports .ATR format files from tiny single-sided, single-density, 5.25" disk images (720 sectors or 92KB) to whopping hard-disk images up to 16MB. Read more in the manual here. * UI improvements, including several selectable "skins" (some resizable). * Now supports Ultra-Speed Disk I/O (3 times standard I/O speed). This has been tested works very well with SpartaDOS 3.2g and also the Ape Warp+ OS Upgrade by Steven Tucker. The CSS Ultraspeed OS is currently not working well with Atari810, due to some small problems to be worked out in the next few releases. I highly recommend these OSes for Atari users, since you can then enjoy Ultra-Speed Disk I/O at all times -- not just when duplicating disks or copying files, but even when playing games, viewing demos, compiling code, etc. * Please let me know of any other incompatibilites that you find with other "High-Speed" OSes, DOSes, or other software. * Atari810 now supports setting the Atari clock, and is compatible with the standard set by APE, and existing utilities (APETIME.COM). * The stack was being corrupted in the driver and causing the program to crash in rare cases; this is now fixed. * more bug fixes. Now supports High-Speed Disk I/O (2 times standard SIO speed), when using a high-speed capable DOS, such as SpartaDOS. * many minor bug fixes in the ui, emulation, and disk image creation. Many thanks go to Nick Kennedy who designed and developed the orginal cable and SIO2PC program, and for graciously posting his source code. 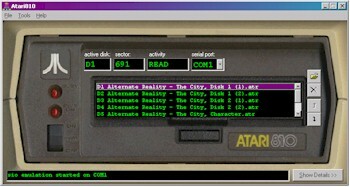 Atari810 derives many of its algorithms and data structures from Nick's original SIO2PC source code written in 8086 assembly language. Visit Nick's page here. To use this emulator for any practical purpose, you need an SIO2PC cable. The parts you will need are mainly this cable since the driver and other parts including the resizebale skin are built in features, so if you are a Parts Geek like I am, know most of those are included now; instead of Atari, you may need to find a hobby in fixing a car like a Ford or Ranger with multiple pieces. Instructions for building one yourself can be found here or here. Thanks to Rick Cortese and Clarence Dyson, respectively, for documenting this simple, yet effective, hardware interface. It is also possible to order a very reasonably priced, yet expertly made cable from j131 on ebay. Check here for his current acutions or visit his web page here.